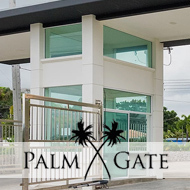 Pornchai Garden were recently contracted to improve the paving areas at the front of this industrial unit in Bangkok. The existing pavement had been destroyed by tree roots, weathering and general wear and tear over the years, and was not only an eyesore, but also unusable. The existing pavement was a combination of interlocking stones and concrete, plus an area towards the wall for grass and planting. The Pornchai Garden team at first took to removing all the stones, vegetation and general debris, so they could flatten the land and install new paving stones. The new stones were sourced and laid with the proper preparation, and cemented into place. All the old vegetation was also removed, so a new planting plan can be discussed, designed and installed. The new walkways are a massive improvement. The old concrete has been smashed out, and removed, as has the old vegetation. The planting areas towards the wall are now ready for grass, plants, and treescape, and the pavement is now flat, laid properly, and usable once again. Do you have a landscaping problem that needs solving in Thailand? The Pornchai Garden team take on all landscaping jobs, from the small to the very large, all over the Kingdom of Thailand, so why don’t delay, contact [email protected] for an informal chat. It is amazing what you now can do with what used to be “boring” products. At http://www.sealmaster.net you can now find pavement maintenance products in all colors and grades. Is anyone carrying SealMaster products in Thailand? Our place here remodel the walkways, after they work on it, We saw the beautiful result. That is exactly what my front walkway looks like. I have been thinking about using either interlocking pavers or stamped concrete to fix it and make it look beautiful. The after pictures of this are amazing, great work!